For patients who desire a dramatic new look or even a subtle change, Dr Karen McNeill is able to combine unlimited options as part of a smile makeover plan. It IS possible to achieve the smile of your dreams. When you’re searching for a cosmetic dentist, you can trust Dr. Karen McNeill to transform your smile into a work of art. She has created countless full mouth reconstructions and has touched the lives of her patients by giving them the beautiful and radiant smiles they deserve. Dr. Karen McNeill has an artistic and cosmetic design sensibility that is rare in the dental profession. Dr. Karen McNeill has been creating smiles since 1992. 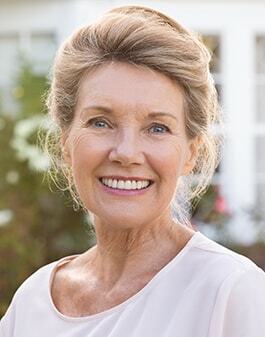 Dr. McNeill established her practice Smile Artistry in 1998, creating one of the very first practices in the Northwest dedicated to Advanced Full Mouth Reconstruction. Dr. McNeill’s area of expertise is Advanced Full Mouth Reconstruction (or more commonly known as “Extreme Makeovers”). She also combines this higher learning with advanced training and knowledge in Neuromuscular Dentistry (NMD). NMD evaluates and treats your overall oral health by considering how your muscles, teeth, bite, and joints all work together. In addition to being highly educated in Full Mouth Reconstruction and Neuromuscular Dentistry, she is vastly experienced. She has created countless full mouth reconstructions and has touched the lives of her patients by giving them the beautiful and radiant smiles they deserve. For patients who desire a dramatic new look or even a subtle change, Dr. Karen McNeill is able to combine unlimited options as part of a smile makeover plan. Sometimes referred to as “extreme makeovers,” smile makeovers are generally not that “extreme” for most patients. Dr. McNeill uses the latest state-of-the-art technology and materials. Consequently, she is able to provide an extensive array of treatment options for her patients. Depending on the desired results, she may use just a few or a variety of techniques to create the perfect smile for you. Furthermore, the latest technology provides options that are generally less intrusive. Creating a natural and beautiful smile is truly a fine art, one that bridges aesthetics and functionality. Dr. Karen McNeill believes that having an artistic eye and the creative ability to sculpt and implement a beautiful smile should never be underestimated. Artistry is a key component in advanced cosmetic dentistry, and Dr. Karen McNeill has an artistic and cosmetic design sensibility that is rare in the dental profession. 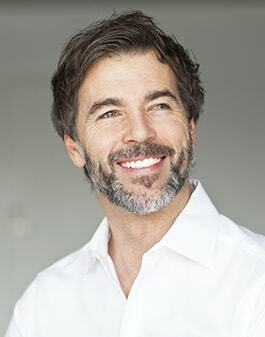 Patients who wish to restore or enhance the beauty of their smile quickly and easily will appreciate the sudden, dramatic improvement offered by porcelain veneers. Also known as “Instant Orthodontics,” porcelain laminate veneers are a “shell covering” placed over the teeth to enhance or correct their appearance. They can close a space between teeth, restore traumatized teeth, repair worn teeth, increase the size, replace deteriorating restorations, conceal badly stained teeth, and straighten misaligned teeth. Hence, “instant” orthodontics – in as few as two visits, you can have the beautiful smile you have always wanted. No two smiles are ever the same. Your smile is as unique as your personality, which is why Dr. Karen McNeill will provide individualized care to ensure your smile reflects your personality and desires. Eat your favorite foods: Missing teeth or unstable dentures make it tough to chew and eat. Dental implants function just like natural teeth, becoming a stabilizing root to help you eat your favorite foods with confidence. Speak with clarity: Slippery and sliding dentures make speech very difficult, causing you to slur or mumble your words. However, dental implants are securely placed within your jawbone, giving you the ability to speak clearly and with confidence. Stop jawbone deterioration: When you’re missing teeth, the jaw doesn’t have the support it needs, so it starts to deteriorate. In turn, this creates a sunken look, making your face appear saggy. Dental implants mimic the tooth root, giving the stabilization your jawbone needs and stopping the deterioration process. Normally, you would need to see an outside professional to place implants. That’s not the case with Smile Artistry. Dr. Reza Atashzareh has the education and experience to place AND restores dental implants right here in our office. You’ll see the same provider from start to finish, giving more precise and accurate results. By directly applying a composite tooth-colored resin material to the teeth and hardening it with a high-intensity light, Dr. McNeill can address a variety of smile concerns. Bonding is a one-appointment procedure that is used for a variety of smile issues, ranging from repairing chipped and broken teeth to closing gaps, covering discoloration, and even lengthening the teeth. We have the skills and technology to remedy a host of oral problems, including those resulting from periodontal (gum) disease. Uneven gums can play tricks on a smile, making teeth look slanted or unusually out of proportion. Too much gum can make teeth look short. To create a more satisfactory appearance, we can reshape the gum line using state-of-the-art laser technology. Lasers are more precise and gentle than conventional instruments, offering greater comfort and reduced recovery time for patients. In addition, lasers can be used to treat cold sores. We can instantly reduce their size and make them less noticeable. Mercury-free, tooth-colored fillings are now the accepted alternative to traditional amalgam silver fillings. Our Redmond dentists will supervise the creation of your fillings to ensure that they perfectly match the color of your existing teeth. No longer do patients have to endure the unsightly look of metal when they smile. As a further benefit, tooth-colored fillings are potentially safer than their traditional counterparts, as many believe that the mercury present in silver fillings may be toxic. Aside from being healthier and more aesthetically pleasing than silver fillings, tooth-colored fillings are also more resistant to breakage. Wear clear customized aligners to move your teeth gradually – week by week – to perfectly straight! Invisalign® allows patients to straighten teeth using a series of custom-made, nearly undetectable aligners. Patients with teeth that are overcrowded, too far apart, or that have shifted since wearing braces may find Invisalign® an ideal solution to their orthodontic problems. 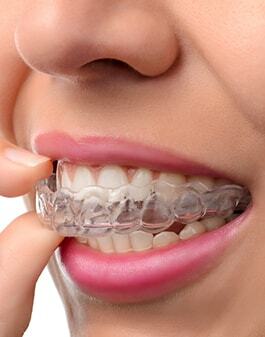 Using the latest advances in 3-D computer technology, we will provide you with a carefully produced series of customized aligners. Each set of aligners is worn for about two weeks, moving your teeth gradually – week by week, millimeter by millimeter – until the intended results are attained. Invisalign® has three advantages over metal braces. First, the aligners are virtually invisible. Second, they are completely removable, which allows you to eat whatever you want. Third, they are more comfortable and have no metal to irritate your mouth. The duration of treatment depends on the severity of your case; however, the average length is about 12 months. At Dr. McNeill’s office, we offer Zoom! 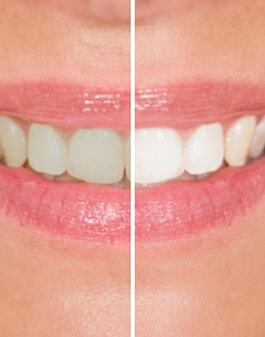 professional teeth whitening treatments. Over the years, we have brightened literally hundreds of smiles through this efficient, gentle, and completely safe teeth whitening system. We are more confident than ever in its effectiveness. The entire procedure requires only about an hour and can be completed in a single office visit. In general, teeth get an average of eight shades whiter — in just one hour. 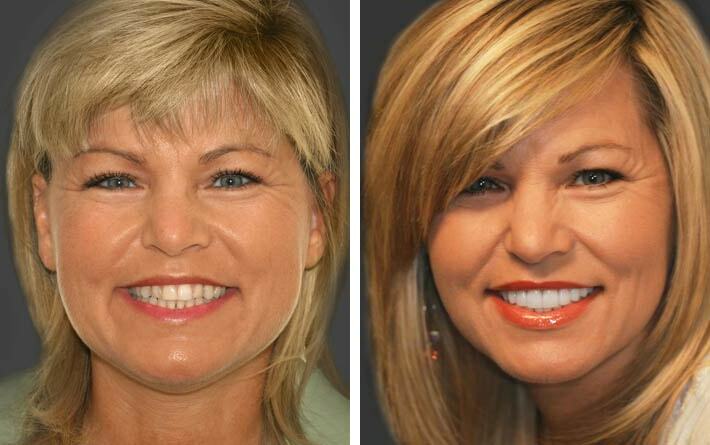 Digital cosmetic imaging is a great way to preview your smile before having any work done. First, we take a digital photo of you and simply upload it onto a computer. 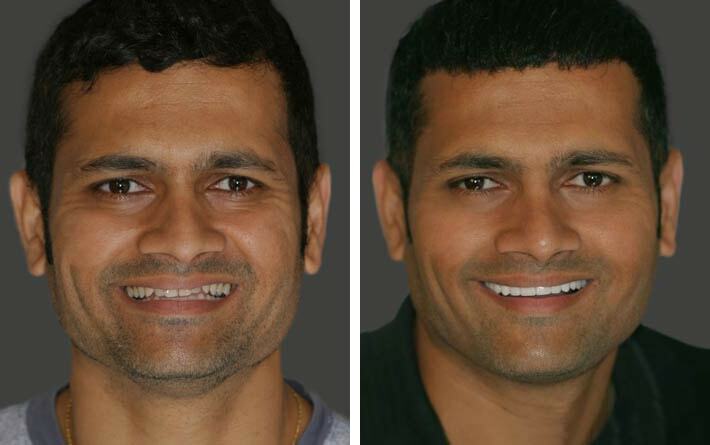 We then use CAD (Computer Aided Design) software to help design your “simulated” smile. This way we get to design and preview your perfect smile together. Once you have made key decisions on your new smile, Dr. McNeill will likely create a “trial smile” that you can test out before the final restorations are made. You will wear this temporary smile for a short time, to make sure you are happy with the shape, length, color, and overall appearance of your potential new smile. Once your final restorations are made, you will have your final office visit to have your new smile completed. At that time, your temporary “trial smile” will be replaced with your final restorations. When your final restorations are placed, Dr. McNeill will make final refinements, and finish your new smile to perfection. Wondering if veneers are right for you? Curious about laser gum re-shaping? Want to know your Smile Makeover options? Have all your basic questions answered with no obligation. Cosmetic consultations are complimentary. You will get to discuss all your options with a highly trained team member on ways we can create your dream smile. Schedule your complimentary cosmetic consultation with Dr. McNeill today!